Is the largest independent theatre producer in China. The company owns thirteen13 theatres in different cities. All these theaters have the same design and technical facilities. The company is becoming a brand in China which stands for quality, modern and new entertainment and stage effects in a luxury environment with very reasonable entrée fee. They also host business events. From the thirteen theatres there are two based in Hangzhou and one in Shanghai. Soon they will open another theatre in Shanghai and one in Beijing as well. There are more than 2.500 people working in Gold Coast Company. They recently have opened their new modern headquarter in Hangzhou (2 hours driving from Shanghai). Gold Coast Company has an artist branch in Beijing. Gold Coast Company produces all shows. The monthly new concept for the show goes to the other theatres. The theatres have between 700 and 1200 seats. Most of the time they are sold out. The shows run every day the whole year around. As an illustration: the theatre in Hangzhou welcomes 2 millions visitors per year. Next year the company will go to the stock market. Founded in1989, IPA realizes every year between five to twelve international productions. In 2004 IPA decided to focus on the upcoming Chinese market. In 2005 a production team left to China. 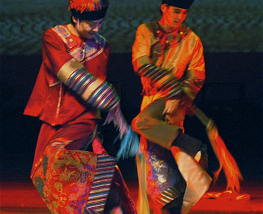 Within limited time IPA represented some of the most popular Chinese performing arts groups and has a long-term co-operation contract with Gold Coast Company. In February 2006 IPA realized the first Chinese – Dutch co production. The idea for China Impressions came from Felicitas Speth von Schülzburg, the founder and owner of IPA, during her first travel to China in 2005. Since then the Chinese – Dutch team is producing several shows with as the most important project China Impressions. Working in the theatre business for over twenty-five years. She started as staff member for programming and pr/marketing and in different big city theatres (Royal Theatre The Hague, City Theatre Rotterdam, Luxor Theatre Rotterdam, Theatre Zuidplein Rotterdam, concert hall The Doelen Rotterdam). As pr and marketing officer she worked with governmental theatre companies. She was a member of IETM and for ten years chairmen of a Dutch theatre group. She worked on different big theatre- and music festival and was member of several governmental arts councils. She founded her own theatre and producing company, International Performing Arts. In 2004 she changed the core business from international productions towards the upcoming market in China.